Lake Huron, bounded on the west by Michigan, USA, and on the east by Ontario, Canada, is the third largest (by volume) of the the five Great Lakes of North America. It is hydrologically inseparable from Lake Michigan, joined by the wide Straits of Mackinac. 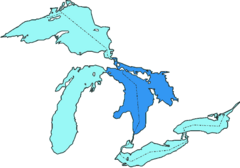 Lake Huron's drainage area, which covers parts of Michigan and Ontario, is relatively large compared to the other Great Lakes. It is actually four separate but interacting bodies of water: the North Channel, the Georgian Bay, Saginaw Bay, and Lake Huron Proper. Named after the Huron Indians by the French, it was the first of the Great Lakes to be seen by Europeans. The French explorers Samuel de Champlain and Étienne Brûlé traveled up the Ottawa and Mattawa rivers and reached Georgian Bay in 1615. The earliest named inhabitants of the region surrounding Lake Huron were the Huron, five allied tribes that were part of the vast Iroquoian nation. Subsistence farmers, hunters, and fishers, an estimated 25,000 Huron lived in villages on the southern shores of the Georgian Bay. With established trading networks, the Huron made contact with Samuel de Champlain at the New France settlement of Quebec in the early 1600s, seeking to pre-empt their rivals, a Lake Ontario branch of the Iroquois, in creating trade with the French. Contact with the Huron led Champlain deep into the interior in 1613 and again in 1615. On these forays, Champlain encountered first Lake Huron, and then Lake Ontario. He also mapped a canoe route from Lake Huron that was crucial to the fur trade. With the first encounter of Lake Huron, the French explorers, not knowing of the other great lakes, called it La Mer Douce, the sweet or fresh-water sea. A Sanson map in 1656 refers to the lake as Karegnondi. Lake Huron was generally labeled "Lac des Hurons" (Lake of the Huron Indians) on most early maps. Warfare and disease eventually reduced the number of Native Americans to a tenth of their original numbers. On the shores of Lake Huron, the aboriginal presence remains, in smaller numbers, in the First Nations community at Saugeen in Ontario. The region along the southern shore of Lake Huron in Ontario was settled largely by Scottish and English immigrants in the second half of the nineteenth century. Farming, trapping, and lumber provided a way of life. Salt mining was an important industry, tapping lenses of salt deposited by the warm salty seas of the Devonian period, 350 million years ago. Life in the Lake Huron area of Ontario has been chronicled by one of Canada's leading writers, Alice Munro. A chief source of supplies for settlement and the villages along the coast was by ship. The dangerous shoals and shifting currents led to a large number of shipwrecks, many of which have been well preserved in the cold deep waters. In recent years, the wrecks of two sailing ships have been uncovered in the sand beaches around Southampton, Ontario, as a result of beach enhancement projects. Near the tip of the Bruce Peninsula, Fathom Five, Canada's first National Marine Conservation Area, is the site of about 22 wrecks. Lake Huron (45°00′N 83°00′W) is the second-largest of the Great Lakes, with a surface area of 23,010 square miles (59,596 km²)—nearly the size of West Virginia, making it the third largest fresh water lake on earth (fourth largest lake if you include the saline Caspian Sea). It contains a volume of 850 cubic miles (3,540 km³), and a shoreline length of 3,827 miles (6,157 km), the longest of all the Great Lakes. The surface of Lake Huron is 577 feet (176 m) above sea level. The lake's average depth is 195 feet (59 m), while the maximum depth is 750 feet (229 m). It has a length of 206 miles (332 km) and a breadth of 183 miles (245 km). 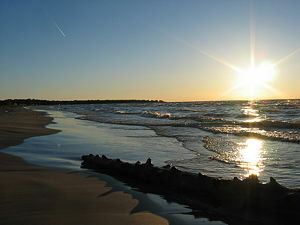 Lake Huron serves as a link between the upper Lakes (Michigan and Superior) and the lower Lakes (Erie and Ontario). 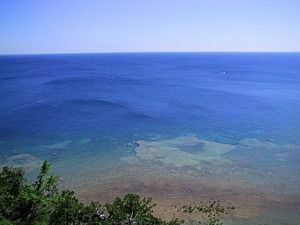 The Mackinac Strait, a deep trench separating the Upper and Lower Peninsulas of the U.S. state of Michigan, links Lake Huron with Lake Michigan. A waterway formed by the St. Clair River, feeding into Lake St. Clair, and the Detroit River connecting Lake St. Clair with Lake Erie, forms the link to the lower Lakes. Lake St. Clair, with a depth of only ten feet, has an artificial channel dredged to a depth of 27 feet to accommodate the large tankers, ore boats, and other Lakes traffic on its way out to Lake Erie. Major cities on Lake Huron include: Bay City, Michigan; Alpena, Michigan; Cheboygan, Michigan; St. Ignace, Michigan; Port Huron, Michigan; Goderich, Ontario; and Sarnia, Ontario. A notable feature of the lake is Manitoulin Island, which separates the North Channel and Georgian Bay from Lake Huron's main body of water. It is the world's largest lake island. Lake Huron viewed from Arch Rock. Lake Huron is separated from Lake Michigan, which lies at the same level, and connects by the narrow Straits of Mackinac, making them geologically and hydrologically the same body of water (sometimes called Lake Michigan-Huron). Lake Superior is slightly higher than both. It drains into the St. Marys River at Sault Ste. Marie which then flows southward into Lake Huron. The water then flows south to the St. Clair River, at Port Huron, Michigan and Sarnia, Ontario. Like the other Great Lakes, Lake Huron was formed by melting ice as the continental glaciers retreated. Prior to the last glaciation, Lake Huron drained into what is now the Ottawa River valley and into the St. Lawrence, near Montreal. The lake's drainage shifted to the south with the isostatic rebounding of the land surface with the final retreat of the glaciers. The land surface is still rising in some areas around the lake by some 13 inches (35 cm) per century. The predominant substrate is made up of Lorraine quartzite and Ordovician limestone. The region is prime fossil hunting territory, due to the ancient warm seas that once covered it. The area around Kincardine, Ontario, is informally known as the "Fossil Beach"; countless specimens wash up on the beaches gathered by private collectors and researchers. On at least one occasion, fossils found there were included in Royal Ontario Museum's collection. Lake Huron is actually four separate but interacting bodies of water: the North Channel, the Georgian Bay, Saginaw Bay, and Lake Huron Proper. Lake Huron has very low population levels relative to the other Great Lakes. Lake Huron also has far more islands than the other lakes. These two factors combine to make Lake Huron and its watershed a habitat for many unique plants and animals. Lake Huron's coastal wetlands and marshes provide nesting and staging sites for 30 species of wading and shoreline birds, and 27 species of ducks, geese, and swans. Huge numbers of birds visit these wetlands as stops along their migratory flyways. Saginaw Bay, at 1143 square miles (2961 square kilometers) is the largest freshwater coastal wetland in the U.S.; many important fish nurseries are located here. All along Lake Huron's shoreline, swales, fens, bogs, and marshes are home to relatively undisturbed diverse plant and animal communities. The more than 30,000 islands of Lake Huron also are relatively undisturbed habitats for some very rare species of plants and insects. Two of the most unusual ecosystems of the Lake Huron region include alvars, and the Provincial Park, the Pinery. Alvars are very rare, unfriendly environments, basically exposed limestone bedrock with very thin, poorly drained soils. With naturally extreme temperatures, alvars are home to very rare, highly adapted plants as well as mosses and lichens. A few conifers survive on alvars, these specimens are some of the oldest living trees in the entire Great Lakes region. Alvars are quite vulnerable to human intervention, even in such a low population area as Manituoulin Island and other places along the Georgian Bay. The International Alvar Conservation Initiative has identified the most endangered of these microenvironments. The Pinery, a Provincial Park on the Lake Huron shoreline in southern Ontario is the site of a Black oak savanna, an oak-meadow ecosystem. With virtually all oak savanna extinct throughout the globe, the Pinery's protected dunes and meadows are home to the five-lined lizard, the only lizard known to live in Ontario, and the bluehearts flower, extinct everywhere but here. In all, 300 species of birds and 700 species of plants have been observed in this rare environment. Major industries located along the Lake Huron shoreline include iron and steel mills, automobile manufacturing, heavy machinery, paper mills, metalworking, salt mining, and shipbuilding. ↑ 1.0 1.1 1.2 John W. Wright (ed.) and editors and reporters of The New York Times (2006). The New York Times Almanac, (New York, New York: Penguin Books, 2007, ISBN 0-14-303820-6), 64. ↑ University of Wisconsin Sea Grant Institute. Gifts of the Glaciers: Lake Huron Retrieved March 19, 2008. ↑ 3.0 3.1 The Island. July 20, 2006. Geology/History of the Island and Region Retrieved March 19, 2008. ↑ Department of Environmental Quality. Water, our most precious resource Retrieved March 19, 2008. ↑ Department of Environmental Quality. Living with Michigan Wetlands Retrieved March 19, 2008. This page was last modified on 20 June 2018, at 14:36.